The discovery of the BRCA gene mutation test has been a breakthrough in the early detection of cancer. Since early detection is currently the best tools for survival among this high risk population, the Rabin Medical Center has established the ONLY special clinic in Israel to perform this testing to lead to the treatment and prevention of cancer. The BRCA Multidisciplinary Clinic was founded to serve patients with a high risk of cancer at Israel’s Rabin Medical Center’s Davidoff Cancer Center—a world class facility whose sole focus is on the treatment and prevention of cancer. The results of this genetic test make a significant difference in the lives of people at high risk for cancer. With breast cancer at such a high rate in Israel, affecting about 31% of women suffering from malignant diseases, the BRCA Multidisciplinary Clinic is essential to saving lives. The rate of recovery increases in accordance to the stage of detection of the disease: about 88% of women diagnosed early survived after 5 years, as opposed to 14% of women diagnosed at the advanced stage. This progress is primarily due to early detection, in addition to improved primary care with diagnosis and enhanced treatment modalities. A study proposed by the clinic to advance the prevention of breast cancer is the effect of certain nutrients on decreasing breast cancer in this high-risk population. The results of this study could dramatically impact the management and save the lives of BRCA mutation carriers. The most significant risk factor for ovarian cancer is having breast cancer. Women who develop breast cancer before age forty and have a family history of ovarian cancer are seventeen times more likely to develop ovarian cancer later in life. Another major risk factor is women with a mutated BRCA1 or BRCA2 gene have up to a fifty percent risk of developing ovarian cancer. The Multidisciplinary Clinic at the Rabin Medical Center provides the testing for the gene mutation, which predicts the increased risk of this disease. Prostate cancer is the most common cancer in men over 50. According to the National Cancer Registry, 3000 new cases of prostate cancer are diagnosed in Israel annually and about 400 die from this cancer every year. Research data indicates that men carrying mutations in the BRCA 1 and 2 genes, similar to the syndrome for breast and ovarian cancer in women. Early diagnosis, when cancer cells are confined within the prostate gland allows for more effective treatment, either with radiotherapy or with surgery allowing for the possibility of complete recovery. At the BRCA Multidisciplinary Clinic, the goal is to study and perform treatments for potential prostate cancer with the greatest efficacy and least negative effects. With your support of the BRCA Multidisciplinary Clinic, the Rabin Medical Center can advance the detection, research and treatment of cancer at the earliest stages to save lives. 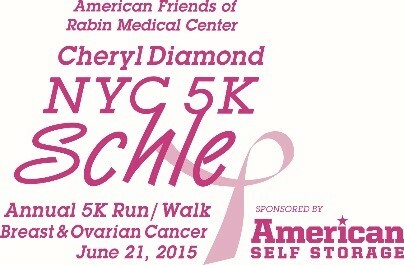 Join us in our fight as we raise money to support Israel’s Rabin Medical Center’s BRCA clinic at our annual our fifth annual Cheryl Diamond NYC 5K Schelp Walk on Sunday, June 21st 2015. Early detection helps save lives and throughout their lifetimes, one in seven women will be diagnosed with breast cancer and over 22,000 women will be diagnosed with ovarian cancer annually.